Sale Frenzy is rated 1.3 out of 5 by 82. Rated 1 out of 5 by engrose from How disappointing! I too was looking forward to a new time management game....in fact I used to be a member of another game site and left because it was one hidden object game after another! Come on lets have some more time mangement games!!! Purrrrrlease! Rated 1 out of 5 by CarrieS from Utter Rubbish I love Time Management but I lasted about 30 seconds. I so wanted to give it no stars but the system won't let me.Graphics awful, no instructions to know what you are supposed to do. Waste of space. Couldn't even be asked to play for free. 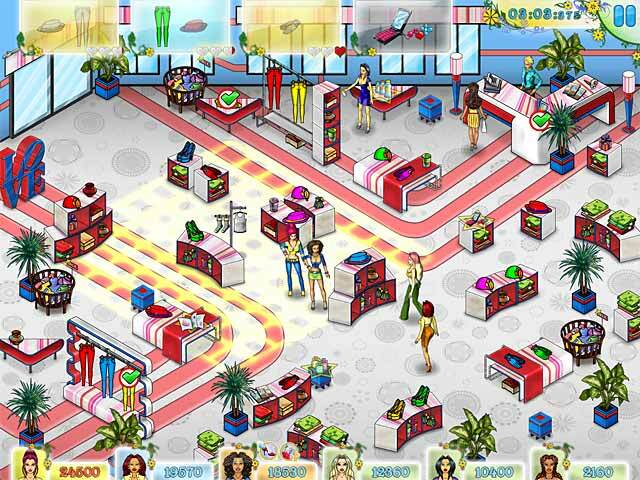 Rated 1 out of 5 by Player282 from Terrible Bad game, boring, not really a time management game, you just look around a store for clothes...THATS IT!! Rated 1 out of 5 by SMullins23 from Elementary without the fun This is awful...graphics are poor. No story plot. Characters are scantily clad and demeaning to women. Tolerated this one for an entire 5 minutes before unloading! Rated 1 out of 5 by catweiss from Boring and slow. Concept and graphics are awful. Save your credits and money on this one. Gameplay: boring and slow. Never gets faster or better. Concept of game is terrible. If you read the story, the concept of the game is and I quote, "to stay fashionable and help an average girl get the attention of the boy she loves." Apparently the average girl needs to look like a professional lady of the evening . 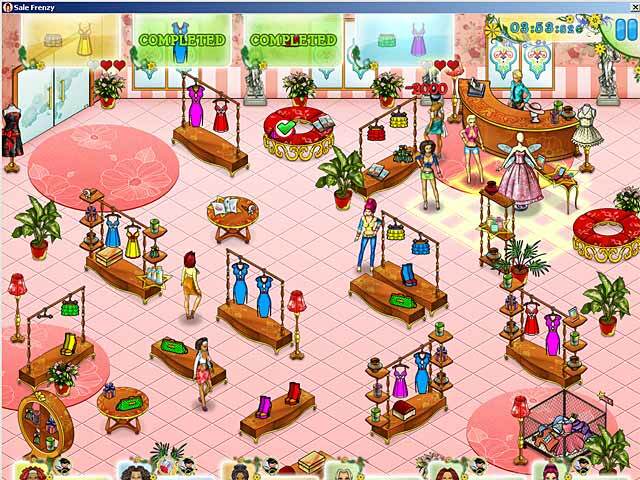 What kind of image are they creating for kids(girls) who like to play time management games. The game play is so simple that young children might find it fun; however, the concept conveys that the average girl needs to dress scantily in order to get a guy....not an image/concept I would want my daughter to have. Save your credits or money and wait until BigFish offers a better Time Mangement game. Hopefully they won't insult us by offering another TM game like this. I have credits waiting to be spent and if I have to wait another 6 months for a good TM game to be offered, I might have to cancel. Why pay every month for a credit I can't use. Rated 1 out of 5 by Amyru from boo boring & slow. I love TM games but this one is a waste of time. Rated 1 out of 5 by Vexatious from Slow & Boring Played for 4 minutes... Even after reading a lot of bad reviews just to see... Very boring pointless game... This is coming from someone who loves time management games! Rated 1 out of 5 by cra27 from Poor story line Couldn't figure out the objective or if there was an end goal. The game was slow and the graphics weren't very good. The message wasn't good either. The main character had to dress in provacative clothes so that she could get into a club to see a guy she thought was cute. Not a good message and not a well put together game. Rated 1 out of 5 by Chattn215 from Awful!!!!!!!! this game is awful.don't waste your time. Rated 1 out of 5 by Kate60983 from Not worth the download I thought I'd give it a try, despite the awful reviews, but I didn't even make it 10 minutes. The concept is basically that a girl, dressed like a normal person I might add, suddenly sees some guy that she falls madly in love with but she apparently suffers from such poor self-esteem that she feels the need to shop desperately despite her lack of funds in order to impress him. The storyline is unoriginal to say the least. Directions are poorly written so that you really never gain an understanding of what your goal is throughout the game. Your character mostly runs around grabbing random clothing items. I would absolutely not recommend this game. Rated 1 out of 5 by niffer16 from Pants Instructions were awful, game played really slow, whole thing seemed incredibly pointless... deleted game within 2 minutes of downloading it. Don't bother! Rated 1 out of 5 by michtest from horrible!!!!!!!!!!!!!!!! This is one of the worste games I've played!!! Boring as can be. Couldn't even finish the free hour, only played 20 minutes. DON"T waste hard earned money on this one. Rated 1 out of 5 by ddmpinc from Terrible time management game Was looking forward to a new time management game and was very disappointed. Their is no skill needed for this game. The instructions are poor. Still have no idea what the goal is for the game. Deleted the game from my computer after 15 minutes of confusion. Rated 1 out of 5 by 5k3c0k from AWFUL This game is just so awful I can't find the words. Rated 1 out of 5 by Jezabel41 from Lame Wow - this game is lame. No skill needed and it is extremely repetitive. I'm still waiting for a GOOD TM to come out soon! Seems like I've been waiting for awhile! Rated 1 out of 5 by zentonia from Pretty lame Sorry, but lil too basic. No real instructions on what to do, not that you need them. No fun factor - very repetitive. Rated 1 out of 5 by xfilerenee from Not fun played one level, then uninstalled it. Horrible play, i didn't like the whole competing against these other two people, it was very confusing on what to click on. Rated 1 out of 5 by bep1 from Not a Good Game I love time management games, and I am always happy to see a new one that is out, but this game was sooo disappointing. It was hard to follow, even though I read the instructions twice beforehand. I got confused early, plus it was kind of boring. I couldn't get anywhere with it, though I played for a half hour. It just isn't fun. Rated 1 out of 5 by TJC333 from So horribly boring I turned it off after 6 minutes. Don't waste your time with this one. I was super excited for a time management game...but this one was a huge disappointment. The game play was boring, the graphics were not great and the music is annoying. Just skip it! Rated 1 out of 5 by Dj2798 from disappointed.... I was excited to finally see a new time management game for download, but this was almost impossible to play. The font is difficult to read, the rules don't make any sense and it's hard to follow. VERY disappointed! Rated 1 out of 5 by fayrose from I just didn't get it Not my cup of tea. DIdn't understand the rules won 1st in all shops but could not get passed first level? Maybe it was me but it was not worth the effort to learn. Rated 1 out of 5 by visagrl559 from yuck All I have to say is WTH????? This is awful! Do not waste your time! Rated 1 out of 5 by vericari from Ugghhh Messy & confusing, no clear goal at all....played for 10 minutes wanting to give it a fair shot, but the game has no direction. Rated 1 out of 5 by erynfaith from Not good only played 3 or 4 minutes and got thought the first 3 levels... no challenge... didn't look like it was due to change. Rated 1 out of 5 by Ondie from Disappointed I too have been waiting for a great new TM game and this was not it. It was boring and did not make much sense. Rated 1 out of 5 by nessamarierose from Worst game ever I am so glad I read the reviews of this game and just tried it, instead of purchasing it as I do all the time manangement games, which there have been a serious lack of lately. This was absolutely, positively the worst game I have ever played. It is not remotely fun or challenging. I would not recommend this game at all! 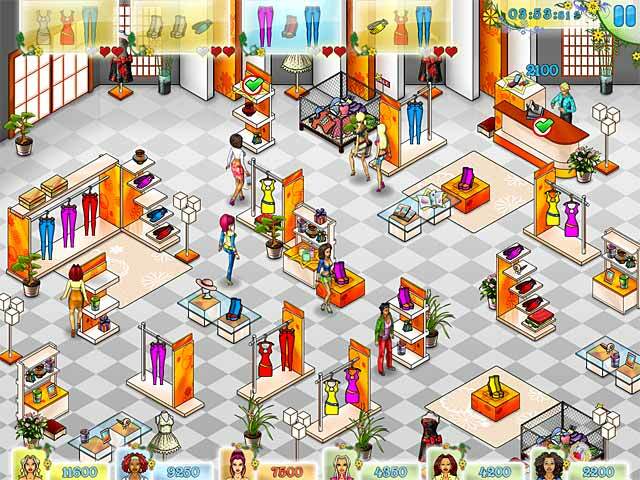 Stay fashionable in Sale Frenzy and help an average girl get the attention of the boy she loves in this fun Time Management game!